In a way neither side deserved to lose this pulsating tie, a match that swung dramatically and, quite simply, had everything. It ended with Adrián, West Ham�s goalkeeper, throwing his gloves to the ground and charging in like a rampaging bull to fire the decisive penalty past Joel Robles � who had smashed his own spot-kick against the crossbar seconds earlier � and secure his side�s place in the fourth round. It was a fitting way to finish a game that had against all odds appeared to be heading Everton�s way. Roberto Martínez�s side were applauded off by the 3,000 visiting throng and rightly so; they fought back from a goal and a man down following Aiden McGeady�s red card to pull in front during extra time through the excellent Kevin Mirallas and Romelu Lukaku, who had overturned Enner Valencia�s 51st-minute opener. Carlton Cole scored with his first touch to equalise late on before a shootout that ended at 9-8. Robles and Adrián were the stars in a showdown whose cast included every player on the pitch with the exception of James Tomkins. It was cruel that Robles, who had produced countless saves during the game, was guilty of the decisive miss, but West Ham progressed to face Bristol City in the fourth round. His manager, Sam Allardyce, went through the full gamut of emotions. �Unbelievable,� he said. �The highs and lows of one game. Everton have been a bit of a bogey team for us. Lukaku has been a bit of bogey and he scored again. Adrián saved one brilliantly and scored the last one. It was a great finish and one we richly deserved. Everton made no changes from the side that drew with Manchester City on Saturday � while Matt Jarvis and Alex Song started for West Ham � and their current malaise, albeit one that was stemmed by a decent performance against the champions, had heightened the appetite for a Cup run. Mirallas�s introduction in the 67th minute proved a turning point but even his excellent display was not enough. The Belgian hauled his side out of a rut following McGeady�s dismissal and scored a wonderful free-kick with eight minutes remaining. The game had already swung from one end to another but West Ham � decked out in a purple third kit � broke quickly to deliver an opening blow. Andy Carroll received the ball in a deep position 35 yards out and slid Valencia into the right side of the penalty area. John Stones, the covering defender, was well placed and seemed able to contain the threat but a quick burst of acceleration from Valencia and good strength made enough space for a shot, which was accurately placed across goal and into the corner. Soon afterwards, things went from bad to worse for Everton. McGeady, who had appeared a bright spark in the first half, was shown a red card for successive cautions, the first for a foul on Matt Jarvis early on and the second a late slide on Mark Noble. However, Mirallas scored a fine free-kick from the left edge of the area after Lukaku had been brought down, curling the ball brilliantly past Adrián and into the top corner. Later he could have been awarded a penalty but was adjudged to have been fouled outside the area. Lukaku, though, did put Everton in front. The striker had missed from point-blank range just moments before, but a second attempt after being found by Mirallas was not squandered. It was almost enough but Cole scored after being thrown on late in the day by Allardyce, turning home a header down from Tomkins. Cole scored with his first touch after being brought on in the 111th minute and scoring two minutes later. �We had to deal with going down to 10 men with over an hour,� said Martínez. �If anything we were the team carrying the threat in open play, we showed a strong mentality. �I thought we deserved to go through. I thought the effort and performance made us the better team tonight. Cue the late drama. 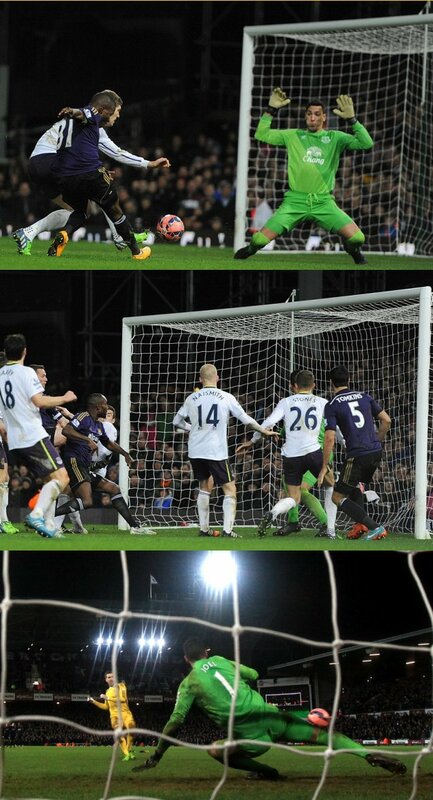 Steven Naismith and Stewart Downing had efforts saved before the goalkeepers, both from Spain, stepped up. It was a matter of centimetres that separated Adrián�s and Robles�s penalties and, after two dramatic FA Cup ties between these sides, they proved to be the difference.